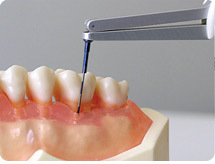 We can measure periodontal pockets faster and more accurately with our constant-force, computerized probe. Instead of having to read the tiny markings on a manual probe and estimate the pocket depth (the space between the tooth and the gum), we now use the Florida Probe. With a tap to the footswitch, your numerical data is recorded with no guessing and no assistant needed to write down numbers. The data is recorded and more importantly, the constant force takes the human element out of the equation and gives us the ability to be consistent from pocket to pocket, and patient to patient. The Florida Probe handpiece tip as it enters the periodontal pocket, which is the space between the tooth and the gum tissue. 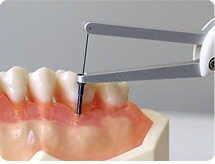 The Florida Probe handpiece tip as it reaches the bottom of the periodontal pocket sends the measurement back to the computer.